The Wallonia Heritage Agency has signed a partnership with the cultural patronage organisation Prométhéa to secure sponsorship in Wallonia and across Belgium as a whole. The Agency is also helping a number of listed monument owners to open a project account with the King Baudouin Foundation Belgium. The Wallonia Heritage Agency (AWaP) is a government department in the Wallonia Region in the southern part of Belgium. The Agency’s remit includes studying and preserving heritage, restoring properties and finding new uses for them, and showcasing and promoting listed heritage in Wallonia. Created in 1999 as the “Wallonia Heritage Institute”, it is now being merged with the Heritage Department to create a new government agency. The new visitor centre and walk-through exhibition at the Villers-la-Ville Cistercian abbey received an award from the Union Wallonne des Architectes at the “Grand Prix de l’Architecture 2017”. The visitor centre and the new exhibition were jointly created by Andréa TENUTA and BINARIO Architectes, with European Structural Funds and funding from the Heritage Department. 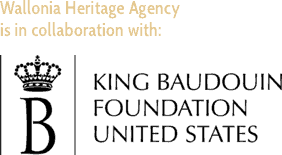 On 1 January 2018, the Wallonia Heritage Institute and the Heritage Department merged to form the Wallonia Heritage Agency.